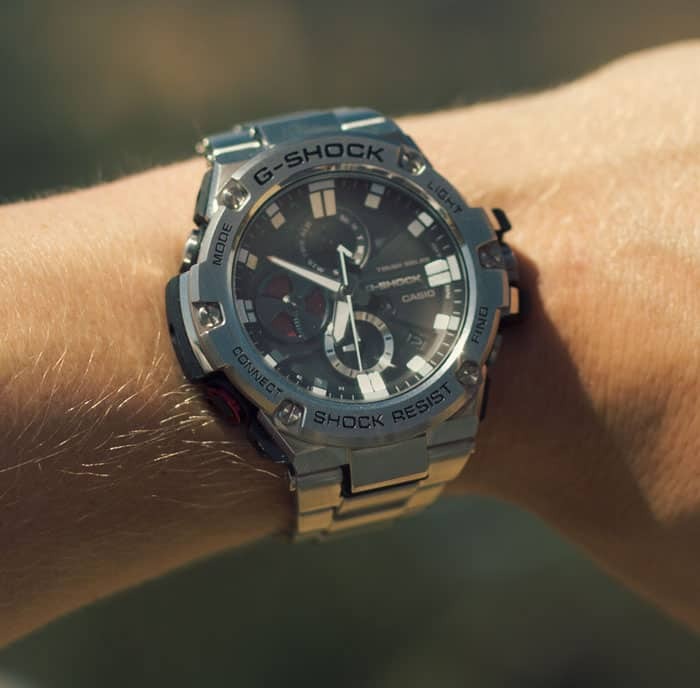 G-SHOCK believes a watch should be resilient and stylish; just like a modern man. We're proud to partner with them on this Getup! You just need to a pick a direction and drive. Spontaneous adventure, seeking out the unknown, the tug of the open road – all are inspiration for this Getup built around the rugged, uncompromising G-SHOCK G-STEEL GST-B100D. We’ve featured G-SHOCK watches before – and you’ve definitely seen the colorful, chunky G-SHOCK on the street – but the fact is there’s never been a G-SHOCK like this. The G-STEEL is equally at home at a 5-star restaurant as it is carving up twisty roads. Designed to withstand G-SHOCK’s Triple 10 test (any G-SHOCK watch must withstand a 10 meter drop, 10 atmospheres of water pressure, and have a battery life of 10 years) the G-STEEL carries on a horological tradition prized by first responders, special forces, and other all-around hardasses who demand toughness and reliability from their watches. As we’ve written about in our testing, this is a heck of a versatile piece. In addition to the legendary anti-shock capability of other G-SHOCK watches, the G-STEEL’s Bluetooth connectivity, LED light (Super Illuminator), and solar-charging battery make it a technological marvel. But in an unexpected twist for such a durable watch, the stainless steel build and thin width mean it’s elegant enough to wear to a business or formal event. The combination of toughness and elegance make it the perfect summer watch – after all, this is the season to hang out, make your own adventures, and take risks you can’t – or won’t – in the cooler months. 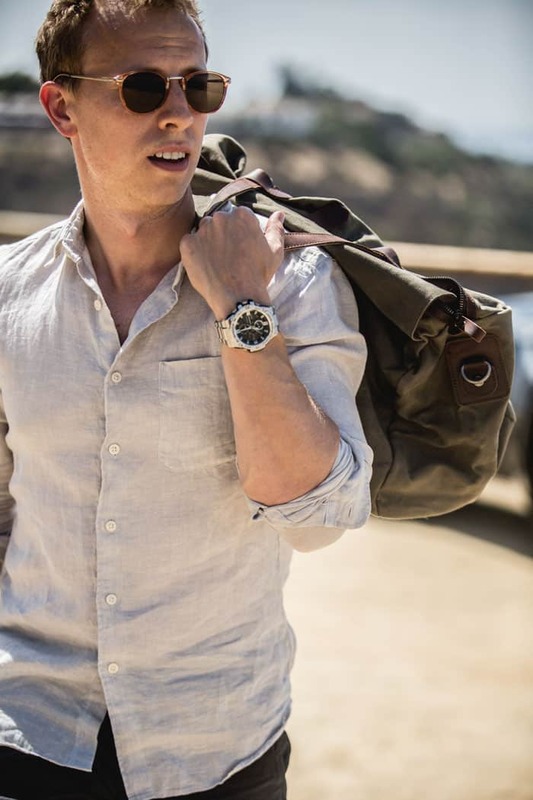 The G-STEEL is paired with a Uniqlo premium linen shirt, which is perfect for the heat. Meant to be worn wrinkled, the texture of this linen piece always fetches compliments when I wear it out. Contrasting the creamy linen are a pair of dark twill chino shorts – any black, darker blue or brown will look great. Further down, you can rock a pair of espadrilles, a traditional fashion-forward summer shoe distinctive for braided jute trim. 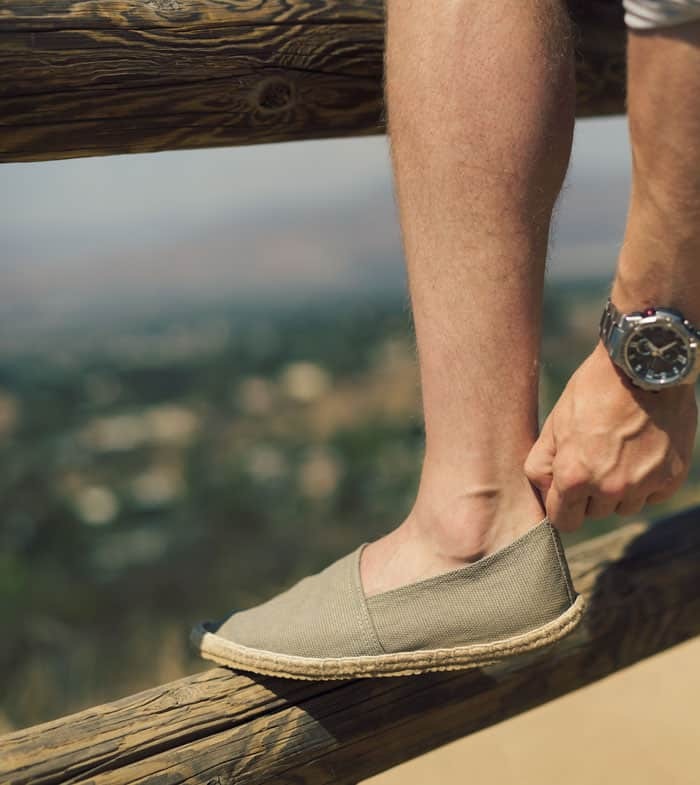 You’d be equally at home in a pair of Toms or Vans if espadrilles aren’t your style. The bag is our team favorite waxed canvas duffle from S-Zone. Rounding out the accessories with the G-STEEL are my trusty AJ Morgan Castro Rounds (full review here). You might notice this Getup is fairly subdued when it comes to color. That’s intentional. This summer we’ve been getting away from the idea that summer clothes have to be colorful. It feels like New England prep, with its bright pastels and bold accent colors, is the default summer reference point for a lot of guys. Which is ironic, considering a lot of the same guys only wear dark or black denim and rugged boots in the fall and winter. Bright colors are great, but I’m increasingly interested in how to make subtle, subdued earth tones, grays, and white work for the ultimate summer outfit. Whether it’s a daredevil adventure or a reflective drive with the top down, I hope this Getup inspires you to seek out your own new backroads this summer. With the right gear, you can’t go wrong. I love the idea behind this getup! Summer weekend roadtrips at a drop of a hat. The linen shirt looks great. I do prefer a cleaner look that can be crisp and lay flat instead of the wrinkled look, but comfort would ultimately win out with me even if there are a few wrinkles. The only thing I can’t get past is the G-Steel watch. From a distance it looks like a versatile divers watch, but upclose I think it looks bulky and like it’s trying too hard to be something its not… a classic diver’s look. But maybe I’m too obsessed with the Rolex Submariner look. In that case if I were to copy this outfit for myself I would have to lean toward the Tisell Automatic Diver. Look-wise it is a perfect homage watch to the Rolex Sub and the various styles vary from $279-299. Less expensive than the G-Steel and in my opinion much cleaner classic look that is always cool. I don’t know if you have any opinion on the Tisell Diver Andrew but I would love to get your thoughts. The only knock I have heard is that ordering it can be tricky. Hey Ross, I haven’t seen the Tisell in person but it has a great look. If you’re looking for a watch more like that I have an Orient that’s great around that price range. Andrew do you have a link to the orient watch? I see your bio says you live in LA – where in LA did you take those pictures? I live here too and would love to go wherever that is to take similar pics with my car! Great summer look. Personally as my work is casual so I could rock this look of the weather is hot enough. As for the espadrilles I’ve got a pair from Toms that I bought a few summers ago, and they’re still going strong. The AJ Morgan’s make great driving sunglasses too. The lenses are perfect for driving as they’re not too dark. Awesome, yeah I love the lenses as well. Great outfit! I’m definitely digging the more subdued palette you’ve been promoting this summer. It’s a refreshing alternative to “top ten bright colors to wear this summer”. One question, is that the white or light gray linen shirt? Andrew, I saw a stingray corvette similar to this today in Milwaukee. They had a luggage rack in the rear. I was diving next to it in my Miller Beer delivery truck. I hope we were both thinking about switching rides and it wasn’t just me! 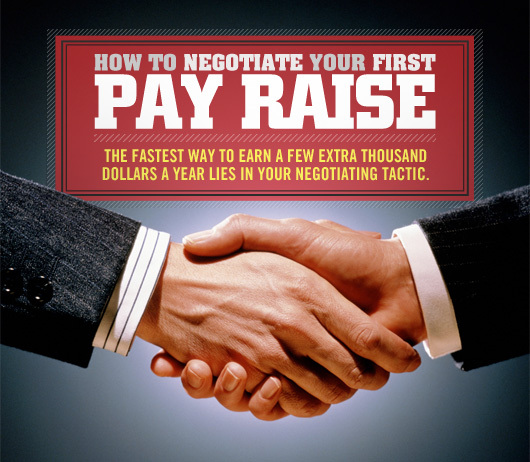 I gave a full report on this article to my coworker as we cruised a couple city blocks. Man, you are so right, there is a lot of car in front of the driver on these! I’m a little late to the game here, but I loved this article! The car is super cool, there is just something about that era of ‘vette that makes any guy do a double take. The getup look is fantastic too – we love road tripping and I always like to look my best. For some reason I just can’t pull off espadrilles or Toms, I’m not sure why but maybe its my wide foot, they just look goofy. Do you think I can swap for a pair of suede drivers in like a sand or light gray or even a light pink to keep the aesthetic of the color profile but something that works a bit better for my feet?